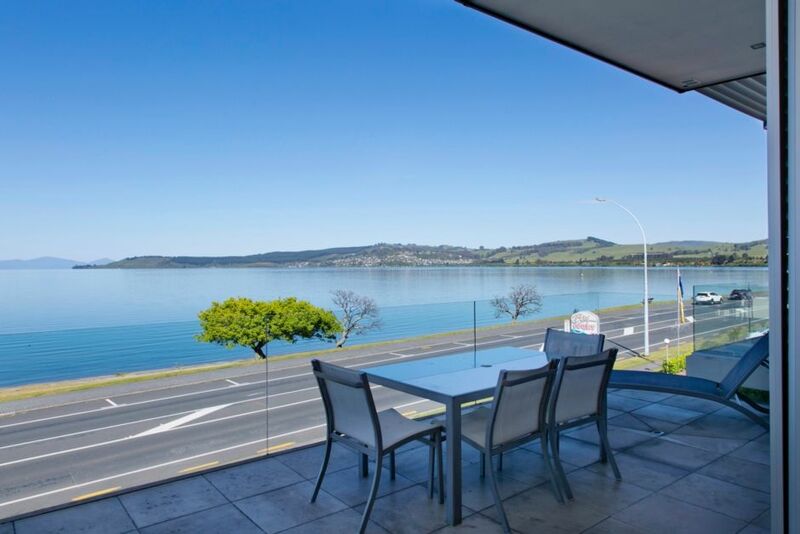 Overlooking Taupo's main swimming beach, handy to restaurants, bars and Taupo town centre. Modern and generous in size with outstanding views across Lake Taupo to the mountains. There are three bedrooms, two bathrooms, two spacious living areas opening to decks at either end, two secure basement car parks and use of the shared swimming pool, sauna, spa and gym. This apartment has all the mod cons, a Nespresso machine (pods not supplied) Wi-Fi, Sky TV and Central heating provides comfortable temperatures all year round. Strictly no parties, a few quiet drinks is fine but you must be respectful of the property and its neighbours. Please note this property is not suitable for small children. Very quiet, great views,beautiful apartment, Thanks for having us. Great location and very well appointed apartment. Very close to the lake, shops and restaurants. Excellent facilities including garaging. Very comfortable and we enjoyed our time here. Would highly recommend this apartment to others. This property is fantastic. Position is superb, it is well appointed and the design is perfect for Taupo. It has indoor outdoor living on both the north and south sides, meaning you have outdoor living no matter which side has sun or the wind. You always have the view of the lake and mountains in the distance.